2017 and 2018 Reviewers’ Choice Product of the Year and winner of the prestigious Platinum Seal of Quality, the DS-11 FX+ combines the most sensitive 1µL UV-Vis absorbance with the most flexible and precise fluorometer in one compact, maintenance-free instrument. The DS-11 FX Series is the first life science instrument awarded the prestigious Platinum Seal of Quality by SelectScience based on scientist reviews for outstanding ease-of-use, performance, service and technical support (SelectScience.net). 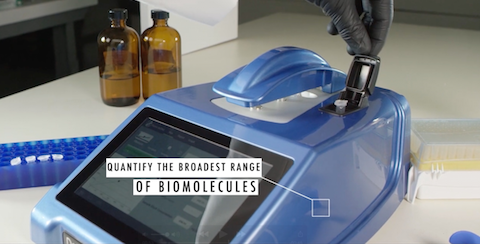 The instrument rapidly quantifies over seven orders of magnitude of nucleic acids and protein samples selecting your choice of UV-Vis or Fluorescent modes. Compare the performance and features of the DeNovix DS-11 FX+ vs. the NanoDrop ™ One spectrophotometer and the Qubit ® Fluorometer. Calibration and maintenance free – no measurement drift, no service down-time. Accurate results every time. SmartQC™ monitors every sample measured for the presence of common contaminants, highlights these samples to the user and advises on potential issues. SmartQC also solves the problem of samples being left to dry on the measurement surface by monitoring the sample measurement and cleaning process and warning when the sample has not been removed. The DS-11 FX Series instruments feature the most powerful and intuitive software of its type. EasyApps® software is designed by life scientists and combines with a breakthrough Android™ touchscreen interface to ensure error-free operation and sample to data in under 4 seconds. Every instrument is ready for absorbance and fluorescence measurements right out of the box – no PC set-up or software installation. The most sensitive and precise fluorometer of its type provides the ability to run almost any common fluorescence assay. Choose from a wide range of pre-configured kits or create custom applications for total flexibility. Combine the DS-11 FX with the DeNovix dsDNA fluorescence quantification kits for industry-leading sensitivity and dynamic range. Quantify to 0.5 pg/µL up to 4000 ng/µL with your choice of three quantification kits.